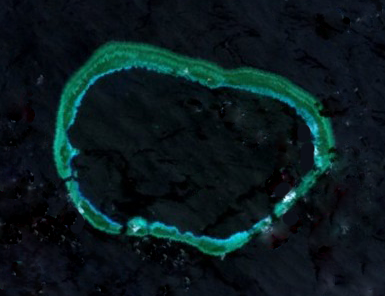 Mischief Reef in 2001, before Chinese land reclamation activities. The United States Navy engages in FONOPs across the world’s oceans to highlight maritime claims by other states that it considers excessive. Despite the regularization of FONOPs in the South China Sea, the United States maintains its policy of taking no position on the sovereignty of disputed features. FONOPs primarily challenge attempts to restrict lawful navigational freedoms provided for by international law. Given China’s extensive island construction activities in the Spratly Islands and militarization activities in the Paracel Islands, the U.S. FONOP program has received more attention than usual in the context of the South China Sea. In early 2015, the United States first began testing the nature of China’s claims in the Spratlys with surveillance flights, leading to warnings from Chinese military authorities in the Spratlys that the U.S. Navy had entered a “military alert zone.” Since then, U.S. activities have intensified in the South China Sea, drawing protest from China, which has on multiple occasions charged the United States with militarizing the South China Sea. To date, the United States Navy has carried out two highly publicized freedom of navigation operations in the South China Sea since China began constructing artificial islands there. In both instances, U.S. Navy vessels sailed within 12 nautical miles to assert innocent passage rights without prior notification, but did not explicitly engage in activities that would assert high seas freedoms. In October 2015, the USS Lassen, an Arleigh Burke-class guided missile destroyer sailed within 12 nautical miles of disputed features in the Spratly Islands, including Subi Reef, where China has carried out extensive land reclamation work. In January 2015, the USS Curtis Wilbur, another Arleigh Burke-class destroyer, sailed within 12 nautical miles of Triton Island in the Paracel Islands. The choice of location for the next FONOP will be telling of U.S. intentions. As I’ve discussed here in The Diplomat before, Mischief Reef in the Spratly Islands offers probably the most intriguing opportunity for the U.S. Navy. What sets Mischief Reef apart from the features that the U.S. Navy has sailed near during previous FONOPs and most other South China Sea features is that it is an isolated feature, within 12 nautical miles of no other island, reef, or low-tide elevation. Moreover, Mischief Reef, before China’s land reclamation and construction activities, was fully submerged at high tide, giving it no entitlement to a territorial sea under international law. A FONOP within 12 nautical miles of Mischief Reef would this necessitate activities explicitly asserting high seas freedoms. The United States has to date been reluctant to engage in a FONOP of this nature, probably to avoid a sharp negative reaction from China. To assert high seas freedom, a U.S. Navy vessel would have to engage in activities that violate innocent passage, including launching ship-based helicopters, sailing with fire control radars on, and even gathering intelligence. The U.S. Navy conducts freedom of navigation operations in the South China Sea under a long-standing program, which upholds the United States’ Oceans Policy of 1983 which notes that the United States “will exercise and assert its rights, freedoms, and uses of the sea on a worldwide basis in a manner that is consistent with the balance of interests” reflected in the United Nations Convention on the Law of the Sea (UNCLOS). China has signed and ratified UNCLOS; the United States is not party to UNCLOS. South China Sea Update: Assessing the US Freedom of Navigation Operation in the Paracel IslandsNext US Navy South China Sea Freedom of Navigation Operation: Mischief ReefSouth China Sea Update: Freedom of Navigation Operations and International LawFrom a Slow Simmer to a Boil: Managing Tensions in a Heating South China SeaAre France and the UK Here to Stay in the South China Sea?